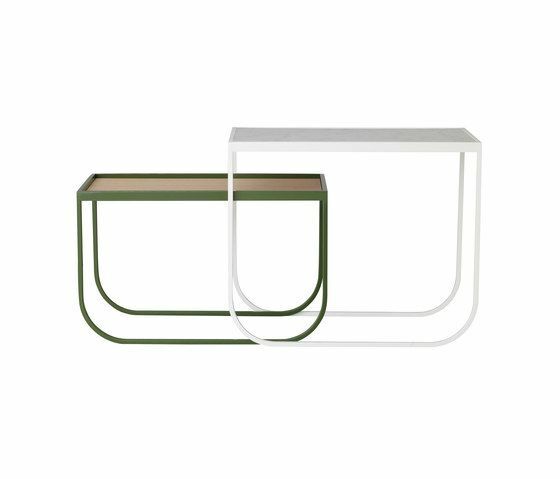 The TATI nest of tables, an innovative and versatile collection designed by Mats Broberg andJohan Ridderstråle, became one of ASPLUND’s big success stories for 2011, winning the coveted Wallpaper* Design Awards 2012. This year the series is extended with a mirror, coatrack and two different tables — a rectangular and a circular dining table. The range comes in a variety of colours, including lilac, white, grey and green. The TATI series became one of ASPLUNDs major successes in 2011 and 2012, winning the Wallpaper* Design Awards 2012 and Furniture of the Year 2012 by Sköna Hem and the Tati Dining Table best Kitchen Product 2013 by Elle InteriorArray. This years addition is a small desk with a drawer designed to fit a bedroom, small home office or hotel room. The desk frame in lacquered metal comes in colours of white or storm grey with a desktop in white laminate, white lacquered, oak veneer (or leather). Available with optional drawers (max 3) in oak veneer, either white stained oak or black walnut oak with a small brass detail. The new addition to the much beloved and awarded Tati series is a small and elegant nightstand/sidetable which is easily placed and perfectly suited for both homes and hotels. The Tati side/ lounge table was originally the first version of the Tati-tables. Now featured with a glass top, coloured or clear. Comes in two sizes; small/high or a long/low. ASPLUND is one of Sweden’s leading and most cutting-edge design and interior companies.